Eastern Mennonite University’s offense was in high gear despite being off for the week due to final exams, as the basketball men shot nearly 53 percent from the floor and got past Milligan College 88-83 at the Don Glick Classic in Bridgewater. The Royals held of a second-half comeback by the Buffaloes and scored the final four points of the game, all on free throws. EMU finished the Don Glick Classic with a 1-1 mark and wrap-up the weekend with a 5-3 record overall. Milligan, who received votes in the National Athletic Intercollegiate Association National Poll this week, slipped to 10-4 on the year with losses to EMU and Bridgewater College. Eastern Mennonite and Milligan were locked in a tight first half until Ryan Yates (Alexandria, Va./T. C. Williams) kick-started a late run which put the Royals up 40-32 at halftime. The senior scored 11 points, including nine in a row, in an 18-10 run which broke a 22-all tie. But led by Mickey Woods, the Buffaloes came stampeding back in the second. At one point he hit back-to-back three pointers near the end of a 25-16 run, which gave Milligan a 57-56 lead just six minutes into the final frame. The Tennessee team had their biggest lead at 74-68 after a James Songster three ball with 7:22 to play. The Royals took over from there. The men held their opponents scoreless for nearly four minutes, scoring nine unanswered during the stretch. Marcel Crump (Richmond, Va./Highland Springs) capped the surge with a three-point play, putting EMU in front 77-74 with 4:09 to go. Woods hit another three pointer to tie things back up. Yates converted a three-point play of his own to give the men a little breathing room at 82-79 with 2:40 left, but the teams continued trading points. Morgan McLeod hit a jumper to pull the Buffaloes back within one with 1:39 to go, as EMU led 84-83. Both teams came up empty on their next possessions, but Crump rebounded his own missed shot with 34 seconds remaining to keep the Royals in charge. A quick foul put Jerome Jones (Charles Town, WVa./Washington) at the line, and the freshman hit both free throws to push the edge to three. Woods missed a three ball and David Falk (Madison, Va./Madison County) essentially sealed it by grabbing the rebound, getting fouled and then hitting both free throws with eight seconds left. Milligan missed a quick three and let Jones run out the time as he grabbed the final rebound. Although EMU struggled to slow down the Buffaloes, they out-shot them 52.6-to-45.2 percent. Milligan his eight three pointers, but the men repeatedly got to the foul line to keep the edge. They were 24-40 from the stripe compared to 19-29 for MC. Yates finished off a multi-faceted night with 22 points, eight rebounds, five steals and three assists. Falk hit a double double with 20 points and 13 rebounds while Crump added 17 counters. Jones scored nine in his second-straight start while James Williams (Capitol Heights, Md./Archbishop Carroll) added four assists. 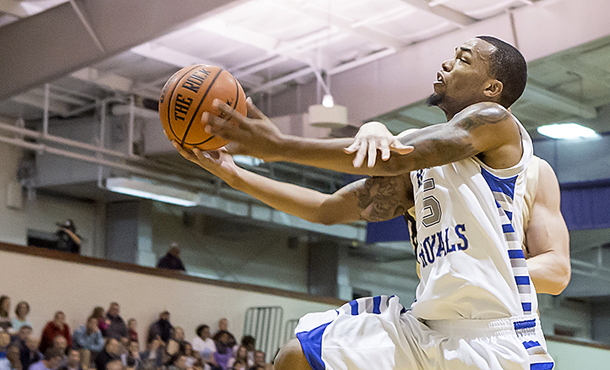 Woods led all players with 31 points, including 6-of-9 shooting from outside. Julian Bailey had 14 points and 13 rebounds off the bench.